It’s going to be a busy and exciting year for us as we are preparing to launch our gourmet mobile food trailer. 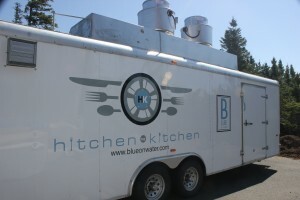 Here’s your first peak at our trailer whose kitchen can rival the in-house kitchen at Blue. Our plan is to bring the mobile kitchen to special events, private functions (for which it can be booked), and outdoor venues, tweeting it’s location on a regular basis. The menu is almost complete but we are still tweaking it so we’ll keep that under wraps for now. If you have any ideas or suggestions as to something you would like to see on the menu, please send it to me ([email protected]) and I’ll bring it before the panel of judges (Jason and Sully). We’ve also entered the next phase of our facelift to the buildings on Water Street. Progress has stalled because of the early snowfall but as soon as the temperature warms, we should be able to get right back at it. Thanks for eating, drinking and being merry with us in 2013 and join us for the exciting things happening at Blue this coming year.